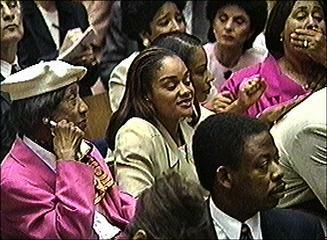 LOS ANGELES (CNN) -- In the seeming eternity before the "not guilty" verdict was uttered, O.J. Simpson's face assumed emotions at both ends of the spectrum. First he furrowed his brow in seeming concern. Then he stiffened his jaw. Then he smiled slightly. Then he looked more concerned. Moments later, he was wearing a smile. And reactions from both players and observers in this "verdict of the century" revealed a similar array of responses. The verdict brought tears to both sides. 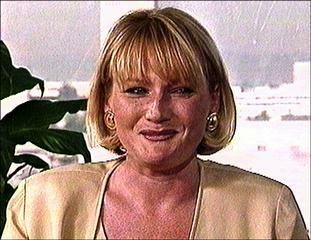 Just as Simpson's son, Jason, sobbed with head in hands, so did Ronald Goldman's sister, Kim. Simpson's daughter, Arnelle, hugged her brother, reportedly saying, "We did it, Jason." KCAL correspondent Frank Buckley said he focused on Goldman's father, Fred, during that stunning moment. "Fred Goldman closed his eyes as the verdict was read," Buckley said. When he heard the words, "he looked as if he had been punched." 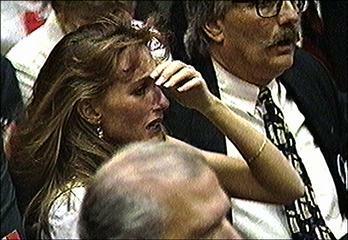 Nicole Brown Simpson's family bowed their heads as if in shock. They remained stoically silent, though they looked tearful. Later, correspondent Jim Hill saw members of the victims' families making their way through the courthouse hallway. "It was a heartwrenching sight," said Hill, noting that Goldman and Brown family members clutched each other, heads down, crying out loud and gasping. A few minutes after the families left the corridor, Hill said, he heard a man screaming, "No! No! No!" The jury sat stone-faced while the verdict was read, as it has throughout the trial. Reporters in the courtroom said jury members stared straight ahead, showing no visible reaction. However, KCAL's Buckley said that one juror, a middle-aged male, raised his fist in an apparent gesture of solidarity to the defense as he exited the room. (248K AIFF sound or 248K WAV sound) Buckley said a female juror began crying, perhaps in response to sobbing in the courtroom. The judge announced that jurors have agreed not to speak to attorneys or the media and said they want their private information to remain confidential. Cheers erupted amidst the throngs surrounding the Los Angeles Criminal Courts Building. Simpson supporters jumped up and down, waving signs and yelling, as mounted policemen held their position. At the AME Baptist Church, the largest African-American congregation in the city, viewers sprang from their seats in joy at the announcement of the verdict. Defense witness Kathleen Bell cried, expressing concern over her troubling role in the case. Although used by the defense to discredit Mark Fuhrman, Bell believed Simpson was guilty. "This is very hard to take," she told CNN. "Watching the families crying is very difficult." Asked if she would come forward again, if she had a chance to make the decision over, she said, "Yes, unfortunately." Looking down, she trailed off, saying, "... stupid." The defense was predictably elated. 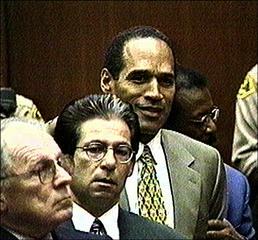 Attorneys Johnnie Cochran and Robert Shapiro held forth in a news conference, supported by members of the Simpson family. "Mr. Simpson is ecstatic," Cochran said. "We are all ecstatic." Cochran thanked God, then introduced Jason Simpson, who read a statement from his father. In it, Simpson reiterated that he "would not, could not, did not" kill his ex-wife and Goldman. He said he would devote his energies to finding the real culprit behind the murders. (330K AIFF sound or 330K WAV sound) Simpson family members stressed their personal faith, strong bonds and unwavering commitment to O.J. 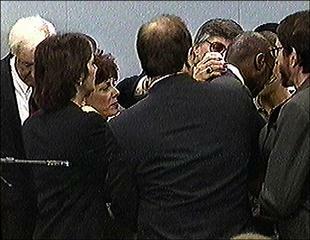 Cochran ridiculed on the charge that verdict was based on emotion rather than evidence. "If you watched the trial, the idea that we didn't have the facts is preposterous," he said. "... Before socks, gloves, Fuhrman, this case was based on time." He said the defense showed Simpson would not have had time to return home, dispose of evidence and clean up before he first spoke to the limousine driver. Asked about the "race card," Cochran said, "Race plays a part of everything in America. ... In this case, it was introduced by witness Mark Fuhrman." Robert Shapiro was asked about the perception that wealthy Americans do better in court. "There's a lot of truth to it," he said. "It worked both ways in this case. Our small group of lawyers here were up against perhaps the most intense investigation in the history of criminal justice. If we did not have adequate resources, we wouldn't have been able to (come through)." 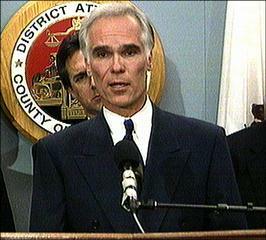 Los Angeles District Attorney Gil Garcetti hosted a somber prosecution news conference fraught with restrained emotion. "We are all of us profoundly disappointed with the verdict," Garcetti said. (325K AIFF sound or 325K WAV sound) He opened with a request that "we remember why we're here," invoking Goldman, Ms. Simpson, and "every other victim of violent crime." Garcetti urged that women who suffer domestic violence come forward. "We know that there are women in fear," he said. "Think of yourself. Think of the children." The often-fiery lead prosecutor in the case, Marcia Clark, appeared glazed as she thanked her legal team and the victims' families for their "strength and dignity." (288K AIFF sound or 288K WAV sound) "Everyone here has given their all ... in an effort to see that the lives of Ron Goldman and Nicole Brown Simpson were not thrown away," she said. 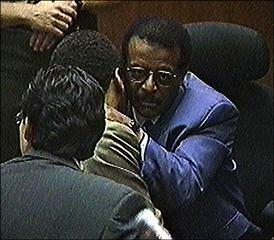 Prosecutor Christopher Darden was more visibly upset. "I never expected that I would be here in this place at the time," he said as he began his statement. (168K AIFF sound or 168K WAV sound) "We came here in search of justice. You will have to be the judge as to whether any of us found it today." After speaking a few moments he broke off abruptly and left the podium overcome with emotion. Goldman's father, Fred, was similarly emotional, calling the verdict the "second nightmare" in his life, along with the murder of his son. "Justice was not served," he said. "I and my family will do everything ... to bring about the forces of change that won't allow what happened to our family to ever happen again. ... I will forever be proud of my son and my family." "This was an emotional trial," Garcetti said. "... Apparently, (the jury's) decision was based on emotion and not on reason."